Vancouver, Canada - January 27, 2014 - International Enexco Limited. (TSX-V: IEC; OTCQX: IEXCF; Frankfurt: I6E) (the "Company" or "Enexco") is pleased to announce that the proposed 13,000 metre (42,650 feet) diamond drill program on the Mann Lake Uranium project has commenced under the direction of project operator, Cameco Corporation("Cameco"). The budget for the 2014 program is CDN$2,900,000 with Enexco's portion being CDN$870,000. The 2014 winter drill program will include up to 18 diamond drill holes evaluating three types of targets; a preliminary evaluation of the area footwall to the western axis of the C trend, the initial evaluation of the conductive features near the western margin of the Wollaston sedimentary corridor and the completion of the systematic evaluation of the remaining targets along the main C trend. The drill program will be carried out in coordination with Cameco's drill programs planned on adjacent projects. The Mann Lake project is located in the heart of what is undisputedly the most prolific and highest grade uranium region in the world, the Athabasca Basin in Saskatchewan. Mann Lake is 25 km southwest of Cameco's McArthur River Mine and is 20 km northeast of Cameco's Millennium deposit. High-grade basement-hosted uranium mineralization was discovered at Mann Lake during a 2006 drill program. The two highest grade intervals are 7.12% U308 over 0.25m and 5.53% U308 over 0.4m at depths of just over 500m. International Enexco, Limited is a North American exploration and development company focused on the feasibility stage, 100% owned, Contact Copper project in northern Nevada and the Mann Lake and Bachman Lake uranium projects located in Saskatchewan's prolific Athabasca Basin. The Mann Lake project is a joint venture with Cameco (52.5%) as operator, Enexco (30%) and AREVA (17.5%) - two of the world's largest uranium companies. 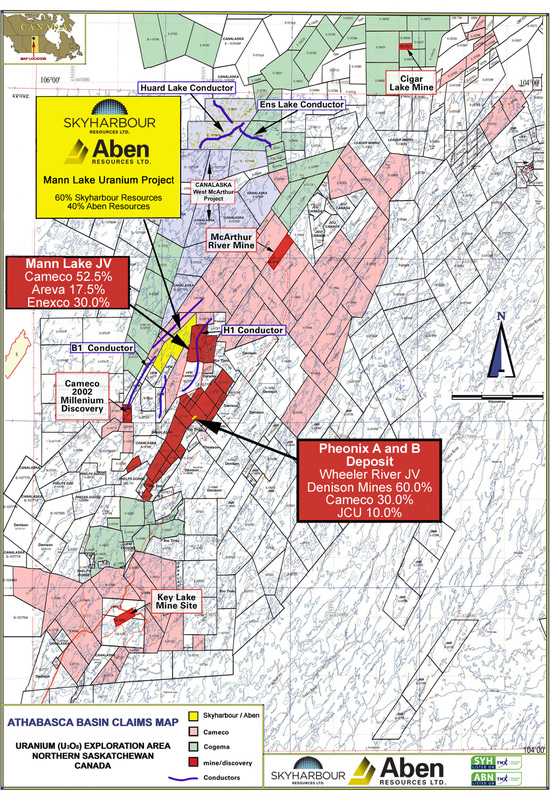 The Bachman Lake project is a joint venture with Denison (80%) as operator and Enexco (20%). Certain information regarding the Company including management's assessment of future plans and operations, may constitute forward-looking statements under applicable securities laws and necessarily involve risks associated with mining exploration and development, volatility of prices, currency fluctuations, imprecision of resource estimates, environmental and permitting risks, access to labour and services, competition from other companies and ability to access sufficient capital. As a consequence, actual results may differ materially from those anticipated in the forward-looking statements. A feasibility study has not been completed and there is no certainty the disclosed targets will be reached nor that the proposed operations will be economically viable. The TSX Venture Exchange or its Regulation Services Provider have not reviewed and do not accept responsibility for the adequacy or accuracy of the contents of this news release, which has been prepared by management. We seek safe harbour.